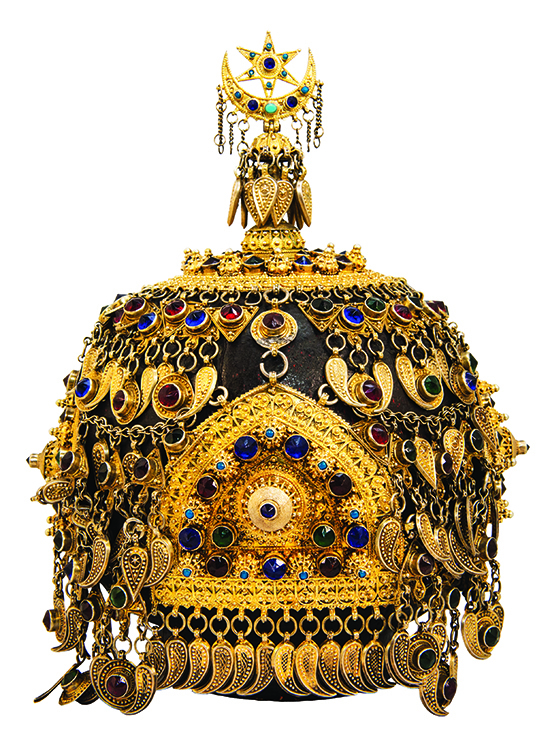 Crown of the Bride, the Taj was an uncommon and precious headdress in the Western Caucasus regions. In ancient times, along with other jewelry that formed the basis of a wedding dress, the Taj took precedence among bridal gifts and was made by special order. 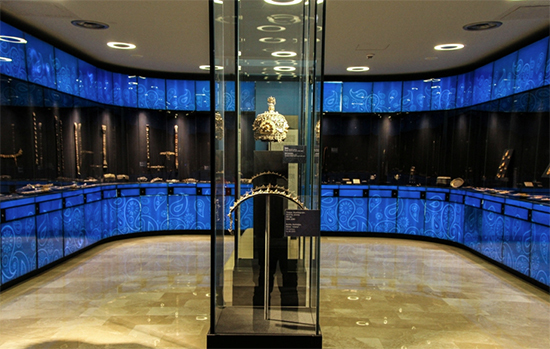 The centerpiece of the Azerbaijan Carpet Museum‘s exhibition of jewelry masterpieces is this 19th Century Taj. The center-top of the cap consisted of a round plate, the entire field of which was decorated with openwork domes alternating with nests of inclusions of colored stones. Above were botehs without swirls and the crescent and star, symbolizing the moon and the sun. A cap of dense fabric was completely overlaid and laced with metal and stones in a repeated shape. 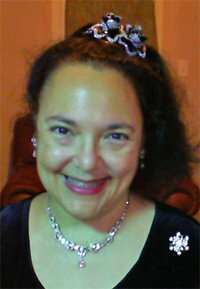 The base of the hat was divided into four parts by triangular plates in the form of domes, the decoration of which echoed the skilled finery of the central part. Descending along the edge of the circumference, both the central and side plates featured long multi-tiered suspensions, with alternating chains and small gilded pendants that symbolized leaves, buds, granules, triangles, and circles, which were made in the stamping technique. The piece was also decorated with colored stones. Some of the stones were single-layered and flat with a relief pattern. Others were “blown,” had volume, and were hollow inside. The sacred power of these symbols was associated with the ideas of fertility, the spring revival of nature, and in this case, also with the fecundity that the woman desired. Taj (headdress). Sheki-Zagatala region, Azerbaijan. 19th century. Silver. Stamping, granulation. Azerbaijan Carpet Museum. 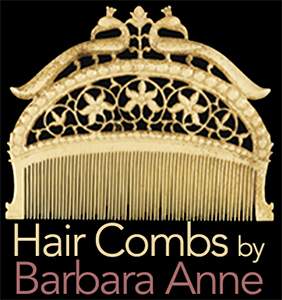 BarbaraAnne’s Hair Comb Blog is sponsored by Ethnic Jewels Magazine and the Ethnic Jewels Community. Such an intricate and beautiful piece. Thank you for this informative article.